Indoor tanning increased in popularity mostly because of its convenience, and other benefits that you wouldn’t get from outdoor tanning such as softer skin and fast results. Your approach to indoor tanning is mostly dependent on your skin type. Generally, there are six types of skins so you should be well informed on your type before purchasing your tanner. Here are 10 best indoor tanning lotions 2019. For those who prefer a gradual glow, which develops slowly through a week, then the NIVEA Sun-Kissed is a product good enough for you. But if you are looking for instant results, this is definitely not for you. Apart from its low price, there are a couple of things to love about this lotion. The NIVEA Sun-Kissed is light brown in color and rubs in evenly. Present in the lotion is a little glitter that gives the impression of a natural glow. Its instructions are to apply it every day for about five days for it to show full results. 5 minutes after rubbing in the tanner, you will be ready to put on your clothes as it will have already dried. It has a very good smell right out of the bottle. Its scent has a hit of vanilla, coconut, and citrus. After around 6 hours of application, it doesn’t smell as good. When you shower the smell disappears, ready to restart the cycle the next day. This is among the most recognized and widely available best indoor tanning lotions in the market. It comes in a dark brown bottle with a koala at the front and an orange cap. Most users have worked with it for years without any disappointments. Most users love that this tanning accelerator has no bronzer. As such, it gives you a deeper and natural tan. Even though tanners with bronzers also contain moisturizers, they turn your skin and the palm of your hands to orange as they contain DHA. 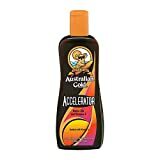 This Australian Gold dark tanning accelerator gives you a deep, natural tan. More interestingly, in just two sessions, you will have a really dark tan. This accelerator is gentle even on sensitive skin and has no greasy feeling. It absorbs relatively fast and contains a Biosine Complex Formula for extreme moisturizing. You can use it together with your sunscreen without any problems. What’s more, its unique Cocoa Dreams scent is very appealing. This bronzer is infused with walnut, Monoi de Tahiti extracts, and caramel to deliver 15 times more bronzing power. On top of that, it gives you a deep tan while retaining moisture as it contains kukui nut, hemp seed oil, and sunflower oil. It has a thin consistency so it may not appeal to those who love a thick one. That said, it may not last as long as a thicker one would. What you will really love about this bronzer is the effect it has on your skin. It leaves your skin feeling and looking soft not only after application but for long afterward. In order to keep your tan from fading, it is advisable that you use it twice a week. Australian Gold Sinfully Black doesn’t stain nor leave streak marks, leaving you with a tan that looks all original. You can also use it outdoors with the same results. However, it is advisable that you don’t use it on its own for a long period of time outdoors because it doesn’t contain any SPF. You can use it together with sunscreen for the best outdoor results. 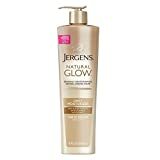 Jergens Natural Glow Daily Moisturizer builds up the tan over a couple of days, appearing more natural with no streaks or inconsistency. When you stop using it, it fades just as gradually until you reach your natural color. Apart from tanning your skin, it reduces the appearance of cellulite, making your skin softer and somewhat tighter. Though not the main objective, this is a huge plus. Even though the results appear gradually, it doesn’t take that long. In about ten days, you will have reached the desired skin tone, after which you can skip a day or two every now and then. It has a subtle scent, which is not really offensive. Applying it is simple and follows the conventional process for all tanners. You shower, exfoliate, dry, and then apply it. 10-15 minutes after applying it, it will have completely dried off and you will be ready to put on your clothes. The Ed Hardy Coconut Kisses Golden Tanning Lotion has been referred to, from time and again, as an “age-defying product”, and it is easy to see why. The high concentration of coconut milk and coconut oil in its composition leave you with smooth, soft, and well-hydrated skin. It also contains a number of nutritious natural ingredients such as vitamin C and E, glycerin, and cocoa seed butter among others. All these work together to live you with great looking skin. The lotion is relatively thicker, absorbs a little fast, and is not greasy to any extent. As it doesn’t contain bronzers, you don’t have to worry about your skin or palms turning orange. Instead of the orange mess, you get a natural golden tan. It has an amazing scent of coconuts and a faint hint of vanilla. It is not overpowering and lasts a considerable amount of time after tanning. If you have tattoos, it may serve you well to know that this lotion comes with a tattoo fade protector to not only protect your tattoos but to also enhance them. It reduces the appearance of cellulite using the “BodyFit” ingredient and has no SPF so you may burn. The best feature of this Sun Lab product is its ease of application. Though somewhat thicker than most, it is absorbed relatively fast and produces a streak-free and smooth look. It is dark brown in color, and it is advisable that you use gloves when putting it on. It produces results instantly, so it is easy to see the spots that you may have missed. At first, it gives a scary dark color, but as you rub and spread it into your skin, it progresses into a natural bronze tint. Your skin will, however, reach its full potential after about two hours of application. The lotion moisturizes your skin as you rub it in, and continued to do so for a while after. 20 minutes after you apply it, you will be ready to get into bed or put on your clothes. Not unless you don’t mind a subtle “self-tan” smell, this lotion will not do it for you. It has a distinct smell that washes off completely at the end of the day. The color doesn’t come off completely during your first shower and will leave you with more than enough. After about three days, nonetheless, you will need to do a retouch. Though not classifiable as a tanner or a bronzer, the Maui Babe Browning Lotion contains iodine and Kona coffee extract which temporarily darken your skin. This is the perfect product if you want to lay by the pool or out on the beach. It is a mixture of kukui nut oil, aloe, vitamins A, C and E, a little mineral oil, and potassium iodide. All these work together to soften your skin while giving you a dark and deep tan. As it has no SPF, you should use it along your sunscreen to prevent burns. Although it may feel a little greasy, it doesn’t stain your clothes and gives consistent results. It is absorbed relatively fast by the skin, and in about 15 minutes, you will have had your amazing results. If you don’t mind walking around smelling like coffee all day, this lotion will work for you. However, when you are out in the sun for a while the scent fades into and awkward teriyaki smell. This product was made for people who want to achieve instant tanning results at a low price point. Its results are amazing, to say the least, thanks to the superb silicone emulsion meld. Unlike most other lotions that produce orange results, the Paint It Black lotion is true to its name and uses the 50X auto-darkening technology to give you a deep bronze tanning outcome. It doesn’t rub on clothes and doesn’t have SPF so it would be best if you used it with a sunscreen. It spreads evenly without any extra warmth on your skin. The silicone emulsion meld featured works to leave you with smooth and soft skin. The results that you get persist for the whole day but disappear after a single bath. On top of this best indoor tanning lotion, it helps with firming the skin. It is made of all-natural ingredients such as fruit and seed extracts, Cucumis Melo, and caffeine among others. These leave you feeling fresh and have no side effects whatsoever. The go-to feature for this sweet-smelling lotion is the use of all natural ingredients. It is a very thick, white lotion that produces a natural color that is spread consistently all over your skin. It takes a considerable amount of time to be absorbed by the skin and produce results, with some users claiming they had to wait for up to 10 minutes. If you don’t mind the wait, then you will love the results you will get after the wait. It takes about 15 minutes to dry completely. Before application, it has a faint coconut smell which appeals to many users. Although it would’ve been much better if it was stronger, at least the “self-tan” smell was done away with. Even when it has been on your skin for a while, the faint scent remains until you shower. It produces wonderful, streak-free results. Although not very dark, it is nice looking and has not even a single hint of orange. It lasts for about 3 days, after which it fades nicely, leaving no patches. It can be used by both genders. If you are looking for a great tanner that leaves you with a silky, smooth skin then this Millenium Tanning’s product will do it for you. On top of its affordable price, it gives natural dark results. It has excellent consistency and is non-greasy. It spreads evenly on your skin and dries relatively fast, leaving you feeling smooth and smelling great. Moreover, it gives out a lovely orchid scent that hangs around for as long as it will take you to hit the showers. It makes use of the 100X silicone bronzer technology to deliver the desired results in a very short time. The different ingredients featured including a tan enhancer and silicone bronze blend assist in moisturizing the skin. It also consists of ingredients such as pecan seed oil, walnut, banana fruit extract, and sunflower among others. It gives instantaneous results, but the full potential of your skin can only be reached after two or three sessions. With 13.5 ounces and shelf life of about 5 years, this lotion will serve you for a long time to come. One thing to keep in mind when looking for a tanning lotion is that what works for someone else may not work for you. As such, you should take a skin test first to make an informed decision. Since each tanning lotion has a specific scent, the product you go for should have a scent that you really enjoy. If you weren’t certain about what scent each tanner has, the above reviews have covered that, alongside other relevant information you need to know before purchasing one.